A SHOT rang out on the still night air, as the old-time fiction writers used to begin their stories. A farmer’s family in Maine; a banker in his library in a middle-western city, and a group of cowpunchers in a bunk house in Texas listened breathlessly; for the sound was carried by wireless. Untold thousands of radio fans scattered from the Atlantic to the Pacific and from the Canadian border to the Gulf of Mexico heard it, too, for all of them were tuned in on the drama “Pierre of the Plains,” broadcast from an eastern city. The old-time thriller of the past, that reached its glory when the box office hung out the “S. R. O.” signâ€”standing room onlyâ€”may have had as many as twelve hundred people hanging breathlessly on the actor’s lines, but nowadays when a melodrama is put on the air its invisible audience may run into the millions. They hear the shot and the heroine’s scream. They listen to the galloping hoof beats of the villain’s horse as he speeds away; the gasps of the wounded hero as he drags himself to his feet and staggers to his own mount; and the rat-a-tat-tat of flying feet as the animal takes up the pursuit. And they hear the fight of hero and villain among the rustling leaves of the forest. 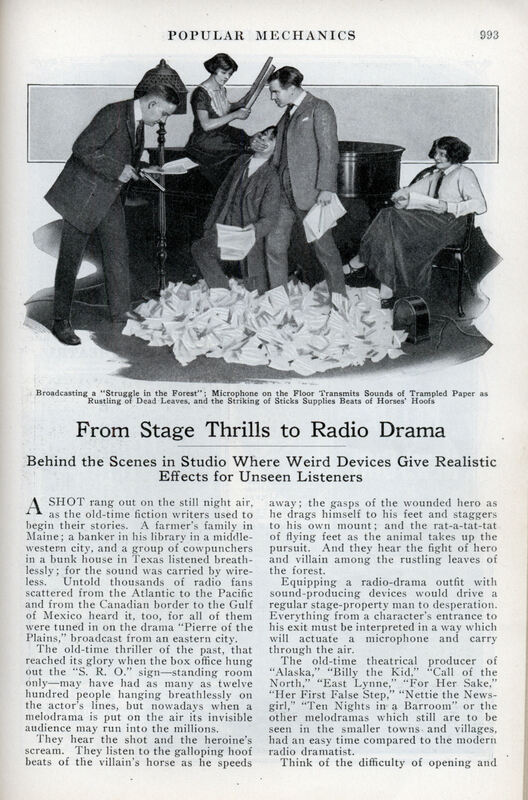 Equipping a radio-drama outfit with sound-producing devices would drive a regular stage-property man to desperation. Everything from a character’s entrance to his exit must be interpreted in a way which will actuate a microphone and carry through the air. 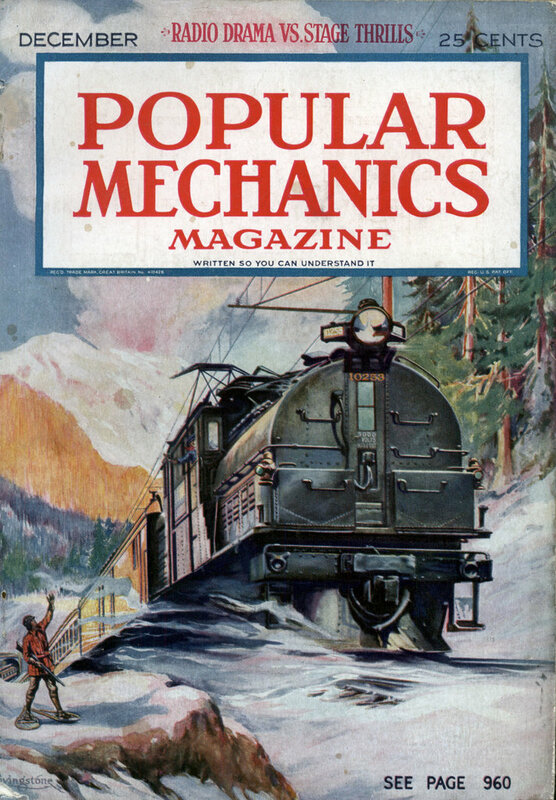 The old-time theatrical producer of “Alaska,” “Billy the Kid,” “Call of the North,” “East Lynne,” “For Her Sake,” “Her First False Step,” “Nettie the News-girl,” “Ten Nights in a Barroom” or the other melodramas which still are to be seen in the smaller towns and villages, had an easy time compared to the modern radio dramatist. Think of the difficulty of opening and closing the door so the sound will not only carry through the air that is full of market reports, static, bedtime stories, monologists, darky quartets, pianists, saxophonists, lecturers on how to make strawberry pie, speakers on Europe’s problems, jazz bands, brass bands, orchestras, and not only carry through all that, but still sound like a door opening or closing when it is received. At the WGY studio, Schenectady, N. Y., where eighty-five plays were reproduced and broadcast in eighteen months, that problem of the entrance and exit of a character was solved by building a special portable door and door frame. The door is constructed of thin oak and has a peculiar resonant quality which makes its opening and closing readily recognizable as a door by the sound. Likewise the lock has a highly gifted click, which transmits well through the ether. Next to the door, which heralds the arrival and departure of every character in an indoor set, the most overworked property device is the bell board. It consists of a convenient arrangement of five bells of different tones and a buzzer, with the necessary dry cells and buttons. There is a doorbell, telephone bell and an alarm gong which may be sounded for fire, ambulance or as a burglar alarm. A clock chime and a tap bell complete the group. But getting back to Pierre, in the drama “Pierre of the Plains.” The shot rings out on the still night air and Pierre falls, feigning death among the leaves. A property revolver in the hands of the stage director fired the shot, and a pile of crumpled onion-skin paper on the floor provides the rustling leaves. Beside the paper is a big microphone which carries the sound across the continent. At the approach of the villain, who believes he has killed the hero, Pierre grapples with him and they struggle among the rustling paper. Pierre is victor, of course, and the winner finally mounts his horse and rides away. A young woman perched on the grand piano, where she will be out of the way of the action on the floor, supplies the sound of horses’ hoofs by clapping two sticks together. A revolving-barrel thunder machine produces thunder just as on the stage. Tin pans, a wire carpet beater, dishes and other homely devices are used to simulate other sounds. Frequently considerable experimenting must be done to find a device that will sound right over the radio. There is plenty of action in many of the plays, despite the fact that the characters are reading their parts from the script, which must appeal to the ear.